Advanced Manufacturing: Arizona is Top 5 in the nation for space & defense manufacturing. Hot careers include Industrial Engineering Techs, First Line Supervisors, Maintenance and Repair Workers, Computer Machine Operators, Machinists, and Welders. Aerospace and Defense: With a projected 18% employment growth, this category represents Arizona’s 4th largest employment with over 32,000 workers and more than 1,200 companies. Hot careers include Aerospace Engineers, Aerospace Techs, Mechanical Engineers, Software Developers and Electrical Engineers. Business and Financial Services: This includes insurance, banking and business services like data processing, hosting and related service companies. Hot careers include General and Ops Managers, Production Managers, Admin Assistants, Customer Service Reps, Training and Development Specialists, Research Analysts and Human Resources Specialists. Emerging Technology: We have more than 75 incubators around the state where technology is being developed in collaboration. Hot careers here include Computer Systems Analysts, Information Security Analysts, Computer Programmers, Software Developers, Web Developers, Database Administrators and User Support Specialists. Healthcare and Biomedical: Here we will see an estimated 54,000 new jobs in the next decade. Hot careers include Medical/Health Service Managers, Pharmacists, Physical Therapists, Registered Nurses, Nurse Practitioners, Medical Records Techs, Nursing Assistants and Phlebotomists. Jessica reviewed the Recruitment Life Cycle with attendees. Referrals are strong through those who are employed. Good employees tend to refer others who are the same. Reputational impacts are always top of mind. Jessica recommends getting to know people and always trying to speak to recruiters. Likability is a major factor in job selection for the recruiter. Often recruiters know whether you are compatible with them within a few minutes. Chemistry between the recruitee and recruiter is key. Social media is another great option to identify potential employers. Ask friends how they like their companies. Find out if they know someone who is at the target company of which you are seeking. It is a fact that 90% of recruiters review a candidate’s social media online. Jessica recommended that candidates always maintain a current Linked In profile. Additionally, ensure the Linked In profile always aligns with the candidates’ resume. Examples where recruiters may view the candidate in a negative light include negative comments the candidate posts about their current or previous employers. Avoid doing this at all costs. Jessica encouraged attendees at today’s event to jot down things they could do to connect with potential employers using social media. Secondly, Jessica explained that most recruiters leverage three areas to decide on the right fit for their company: character, competency and culture. PipelineAZ.com will provide a candidate with a roadmap to their desired end. It is going to be a free service. It was display upward and lateral opportunities whereas it takes a candidates transferrable skills and maps the candidate to a position or industry that fits them. Use this website as a means of finding the right steps to transition into the position in which you are interested. Jessica encouraged ongoing learning and education by candidates. It can be as simple as showing a potential employer that a candidate is current by placing an iPhone on the table during the interview. On silent mode, of course. Jessica also reminded attendees that it is wise to ask those who are closest to candidates to provide insights they may not see in themselves. Document traits of the company and research the company prior to the interview. It is very important to understand whether a candidate is a good fit for the culture of the company. Individuals who are over 50 have excellent qualities to share such as; fewer distractions, and patience with experience. Lastly, Jessica offers the advice of dressing to impress for the interview, having a good firm handshake by matching the other person’s grip. Jessica ended with validating that a potential candidate can and will land the right position. Stay positive and true to your brand. It will happen! WebPT, Jessica Jackson, Talent Acquisition Manager’s opening remarks included her background in the 90s where she began working in an HR capacity as a result of a layoff. 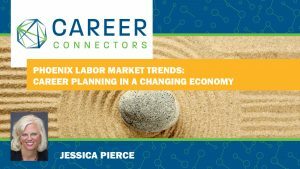 During this time, Jessica met Jessica Pierce who assisted her company with recruiting efforts. Jessica reminded attendees to consider all of their experiences and make the most of their networking opportunities at Career Connector events. Jessica moved into showcasing her current employer, WebPT. Within 3 years, this company grew to be the fastest privately held company. They employ over 500 team members and service 80,000 members. They are a casual company that is collaborative and fun. Toni Rucker is a recruiter for the technology positions. She explained the traditional IT helpdesk structure as well as other frameworks that she hires for at WebPT. This includes customer service, software engineering, and scrum master-type roles. Scrum master is described as the liaison between the stakeholder and the developing team. Farmers Insurance presenter was Surrie Atkins. Surrie began her discussion with a video about the company where attendees learned about the culture of the company, what they value, and the message that customers are at the center of their work. Philanthropy definitely appears to be at the heart of the company. Surrie explained that Farmers is growing by 1,200 people in 2019. For today, Surrie has openings at the I-17/Bell Road location. Two positions are both in customer service at the contact center. Team members will need to obtain their license which is paid for by Farmers. Their philosophy is “low effort” on the part of the customer. Make it easy for customers to deal with their company. The second position is located in an inbound call center. It is heavy customer service and sales for inbound only. This role is base pay plus incentive. Surrie closed her presentation with a video, spotlighting HR recruiting efforts at the company. Attendees asked Surrie questions around number of calls, how a customer service individual is able to meet average talk times, and how the team member can be successful in progressing upward to higher level positions. Allstate representative in today’s session was Steve Morin, Senior Sourcing Consultant. Steve described opportunities in HR, IT, and agency owner options. Allstate has over 70,000 employees who serve over 16 million households, making the 64th on Forbes top 100 employers list. Steve explained Allstate’s culture about fitting needs to customers. For the agency owner option, this is an “owned” business whereby an individual can transfer ownership to their family. It is 100k in initial liquid capital at lift off. They require this to sustain business the first year. Insurance is a need that everyone shares. It is in high demand and recession proof. There is repeat revenue through renewals of policies. Like Farmer’s, Allstate does have a national brand. The company is competitive with a takeaway of 20 percent of what agency owners write. They also receive 6 percent in marketing tools to be successful including social media. Annual income ranges from low hundreds up to 600,000, and beyond, depending on effort of the owner agent. Allstate moves beyond a selling company. There is variety such as claims, underwriting, and community relationship-building. Allstate does not require previous experience. They will develop their talent. Allstate is a strong supporter of veterans. They also offer a $6,000 bonus referral for owner-agent opportunities. Insurance is one of top five industries in AZ. Grand Canyon University (GCU) presenter was Robert (Rob) Loy. Rob is the Head of the non-degreed Technology Programs. Rob provided his background in IT and Communications. When given the opportunity, he welcomed a change to something that he wanted to do for the rest of his career. Rob opened the floor by welcoming students to discuss their experiences at GCU. One attendee asked a student how they were trained to learn coding and prepare for job opportunities in this field. The student offered several helpful options that equip students for future employment. Further expansion of the demonstration included mock ups of the coding. It was extremely insightful for those who were interested in IT and interested in what occurs “on the back end” of a website. One of the students described coding applications such as Java that will “talk to” other databases. Goodwill presenter Ron Mack shared Goodwill’s mission and resources. Goodwill provides career coaching through an advisor where they will review the process and conduct testing to see where a candidate best aligns. Top services are resume critiquing and mock interviewing. Johnny Laurent spent 30 years working for Corporate America, and loves to learn. He believes we learn most from things around us rather than from books. Stress is caused not by what happens to us, but by how we respond to what happens to us. The Ripple Method is a four step process to methodically handle change in our life. It is a four step process to get from where you are to where you want to be. Why are others not successful? What do you think this office needs? Be willing to take the chance. Stress is how you react to situations you are in. Put a plan in place, so you can react to the plan. No matter what you are trying to change, these sets can help you. Don’t rely on yourself. Get help; don’t do it alone. Find out who you are to get to where you want to be. If you don’t have friends to help, invest in a Coach. Tell someone what you want to do. Make a commitment to yourself, and put a plan in place. Firefly Educate is a global IT training company headquartered in Chandler, Arizona. They utilize expert instructors to provide technical training on next-gen networking, computing and storage technologies. Allstate is in over 16 million homes, is #84 on the Fortune 500 List, and continues to grow. They are the Next Generation Recruiting Tools! They are a three-pronged recruiting tool supports small to medium staffing firms. They expedite the search, screening, hiring, and presentation processes making recruiters more efficient. 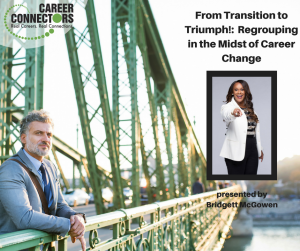 The December Career Connectors events are scheduled for Thursday, December 6th in Phoenix – Master Your Mindset to Land Your Next Job, and Thursday, December 13th in Scottsdale – Becoming Unstoppable – register today. Jessica thanked Central Christian Church in Gilbert, our host facility, and gave a big shout out all our volunteers. He teaches people to redirect and focus their minds to make positive changes in their lives and the lives of others. Travis went on to explain how harmful STD’s, Stinking Thinking Diseases, are to an individual’s growth. He asked the group to close their eyes and imagine their first day at a new job? When this was done and the group was asked to describe what they imagined they did not have Stinking Thinking Disease, because there were no distractions. People with great attitudes possess a teachable spirit. Redirect your focus, because things are always changing and evolving. One must always keep working on strengthening their mind. People have to take responsible for their attitude. People tend to look outward instead of inward for their failures. People have to travel the high road. At times people believe in others more than they believe in themselves. Take a chance by focusing on helping someone else. Treating people the same as they treat you. An example of this is an eye for an eye. Treat people better than they treat you. Redirect your thoughts on rising above any negativity others bring to you. Understand the value of positive thinking. Travis spoke about how his mother impacted her whole community. With only a 5th grade education she possessed a wealth of knowledge and positive attitude on life. Understand the importance of a great attitude. People don’t care if you get knocked down, they care that you got back up. Allstate has a longstanding reputation in the insurance industry with over 80 years in business. There are over 70,000 employees serving over 16 million households. The company’s philosophy is more products = more profits. If you want to be a small business owner, look into becoming an agency owner with Allstate. The University’s Mission Statement is to bring opportunities in the technology field to the masses. For a career in technology students will learn different computer languages such as Java, .NET, Ruby on Rails and more. If you are transitioning in your career and wish to learn more about technology, contact a representative at WozU for additional information. Jessica Pierce wrapped up the meeting by reminding the group to visit the Career Connectors website at CareerConnectors.org for additional information on upcoming meetings, support tools and event recaps. She went on to thank our wonderful host Calvary Church for their support, as well as, all our amazing corporate sponsors and volunteers. Also, Jessica spoke about upcoming events. The next meeting will be held on October 23rd, 9 am at the Gilbert location Central Christian Church – 965 E. Germann Rd, Gilbert, AZ. Please remember to sign up online for our next meeting. Career Connectors will also be hosting a Diversity & Inclusion Career Event on November 8th 10 am to 1 pm at NAU North Valley Campus. You found the perfect job. You crafted a cover letter and resume that promoted your skills & experience. Eureka!!! You get a call from the company’s recruiter for an interview. It’s now time to rock the interview! Are you ready? 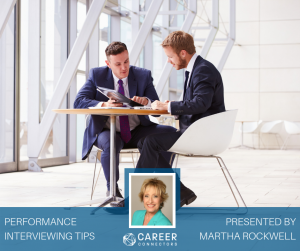 Martha shared with the group the types of interviews to expect. Among them are the pre-screening/third party, one-on-one, sequential and panel. Introduction/Elevator speech: Be sure to tailor your speech to meet the needs of the company. Rehearse, but do not come off as not being natural. Create answers to interview questions & practice, practice & practice. Write out the answers, since most of us are visual learners, this will help you learn your answers. Research the company: Review details for the company by visiting its website, Glassdoor, LinkedIn & recent press releases. Research salary: Determine the salary range for the open position. Pre-plan prior to the phone call: Use flash cards to record anticipated questions & answers. Have four questions ready to ask during the interview. What to wear: Determine what you will wear to the interview. Dress professionally. What to bring: Extra copies of your resume. Be sure to have enough for all participating in the interview. Carry the resumes in a professional portfolio. Have paper to take notes. During the interview: Take notes so you can track the context of your conversation. Frame your attitude or thinking in a positive manner! Including …. Business discussion of areas where there is a mutual interest. Company wants resolutions in areas of potential concern. Rather than looking for ways to disqualify you from the process, think in terms of what you can offer the employer. The hiring decision is mutually depending on whether it’s a good fit. Rather than emphasizing your meeting as an “interview”. Refer to it as a “business discussion”. Doing so will release emotion! Know the difference between negative & positive questions. Think of those interview questions you might be asked & identify them as negative or positive. Your responses should be positive. Be ready for the weakness question. “What are your weaknesses?” Think of a good positive answer. Highlight what you learned & what you changed. Limit your response to “1”! Your responses should be established using the PAR system. Include what you learned or how you changed. Have a list of good questions to ask the interviewer. Make sure to research & ask a question using information found on the company’s website. Will there be a second interview? When is a decision expected to be made? Follow up on established timelines! After the interview, go to a quiet place to debrief & analyze how the interview went. Send a thank you within 24-48 hours! Pre-screen interviews should also receive a thank you, along with each person that participated in the interview. Shamrock was started 95 years ago as a family business. Today Shamrock remains family owned & is the 7th largest foodservice distributor in the US. Business segments are represented in foodservice distribution, dairy production, cooking oil production & retail stores. Shamrock strives to “treat customers as friends & associates as family”. The average tenure for employees is 20 years. The company’s culture & growth opportunities are key factors making Shamrock a desired employer. Benefits are robust at Shamrock. Open positions include: Sales, Bid Specialist Contract Pricing Analyst, Sr. Financial Analyst, Credit Manager, Director of Finance, Cost Analyst, Executive Asst., Customer Care Specialist, & Sr. Software Engineer. To apply go to Shamrock’s website. 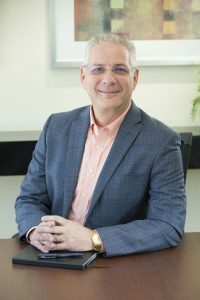 Choice Hotels “connects the world through hospitality”. Choice Hotels are franchised, individually owned & operated. The organization has over 6,800 hotels located in over 49 countries. 2017 provided revenues over $4.1 billion & 22 million customers. Choice also is recognized for SkyTouch which is a comprehensive hotel operations platform. The company was recognized by Forbes for being a 2018 America’s Best Mid-Size Employer & values its employees. Benefits include: health, fun & fitness, life, wealth, community & employee recognition. Some of their current open positions are: Software Engineer, IT Programs Manager, Customer Support Specialist, & Sales Force Business Analyst. You can find a complete job listing here. Allstate was established in Chicago in 1931 & has been in business for 80 years. Allstate is #81 on Fortune 100 list & has an employee population of 70,000 employees in the US and Canada. The SW region is composed of AZ, OK, NV, NM and UT. Allstate is one of the most recognizable brands in America & has 47 products to help serve its customers’ needs. Available positions in the Tempe Regional Office include IT, Human Resources, Product, Claims, & Sales Management. Other opportunities are Financial Specialist, Agency Owner, & Licensed Sales Producers. The company is military friendly & offers free education to veterans & a bonus award of $500. In addition, Allstate has a $10,000 referral award. To learn more about their careers, visit the Allstate site. Sheila Coulam, Vice President of Operations, Career Connectors, closed the meeting by thanking Highlands Church & the volunteers. Career Connectors & WESTMARC will be presenting the West Valley Healthcare Career Expo on September 20, 2018. 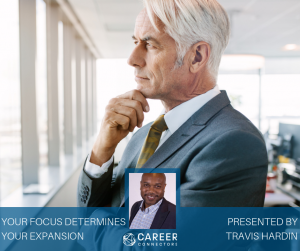 The next Career Connectors meeting will be in Gilbert on Tuesday, September 25, 2018 & features Norris Thomas, as speaker for the topic “Your Why Defines Your Try.” For additional information on this event & future events, please visit the Event Schedule. As we conduct our search to find our next opportunity, we will experience a roller-coaster of emotions. One day we will be coasting and have a “can do”/positive attitude and find our positive mindset results in good things coming our way. The following day we may be spiraling downward and filled with guilt and depression. No longer are we rewarded with the riches of success, but have few if any. We may have an awesome resume, an “All Star” rating on LinkedIn and other social media platforms, but our mental attitude needs to be a positive one to be a success. As we shift to a positive mindset, our confidence level rises. Being confident is knowing what you’re good at, the value you provide, and acting in a way that conveys that to others. Bridgett enthusiastically shared her road to success in reframing your mental outlook. Get comfortable with displaying awesomeness! It is difficult for many of us to openly share how great we are to those who need to know. Don’t be shy in communicating your achievements and what a great professional you are. If you fail to do so, many will not know just how awesome you are. Do something that excites or scares you. Get out of your rut and tackle new endeavors! Ideas are returning to school, starting a blog, collaborating with someone on a project, selling a service or starting a business. Get MORE uncomfortable. Keep pushing yourself to try new things. Mark the past. Find a way to let go of your past. Look at the pros of what you encountered with your previous employer. If necessary, have a ritual of letting go of the past. Cortez burned his own ship! Letting go prevents you from being stuck. Respect the past (position, company, etc.). Friends, family or potential employers do not want to hear about your terrible experience with your former employer. The more you engage in the negative the longer you hold on to your past and ill feelings. Avoid burning bridges. You may want to march into your former boss’s office and give him/her a piece of your mind, but don’t do it. You never know who your former boss knows or those organizations that may share contacts that might open doors for you. Burn some bridges. Get rid of the negative mojo in your life. Take a moment and make 2 lists. 1. Who are the people, things, ideas you need to keep. 2. Those you need to toss. Give great eye contact. Pretend there is an inverted triangle between the eyes of the person you are talking with. Focus your attention on their eyes first the left then the right. Avoid looking away from the individual. Avoid giving reasons for actions or decisions. Respond to criticism only when/if necessary. Don’t just talk about it; be about it. Demonstrate the commitment of your thoughts by showing action. Things do not have to be perfect before taking action. Make others feeling incredibly important. They should feel as though they are a VIP. vCandidates is a three-pronged solution for the staffing marketplace. The company’s focus is to buildup small to medium recruiting and staffing firms while giving candidates the ability to create the best presentation of themselves. The recruitment tools used expedite the search, screening and presentation process eliminating the use of costly job search boards. vCandidates is not another database but a marketplace of pre-screened candidates by the organization’s recruiting and HR team members. The company is a true subscription-based career ecosystem for candidates and active recruiting professionals. The cost for the service is $50 to sign up and $25 per month. For more information go to here. Amazon’s work environment has employees handling many sizes of packages, requires comfortable shoes, emphasizes safety, and earns the trust of customers by making promises and keeping them. Jobs allow employees to move around and feel comfortable while working in relaxed clothing. Employees must be able to lift up to 45 pounds, stand/walk for 4-10 hours a day and may be asked to drive powered industrial trucks. Benefits begin day one for full time employees and include medical, time off options, extra time opportunities and multiple shift options. It is important to know most of the available jobs are part time and focus in fulfilling the customer promise by moving small to medium packages, lifting, bending and standing for long period of times. Shifts are varied and can be 4-day work weeks, full or part time, and day or night; 5-day work weeks, full or part time, day or night; or flexible work week, days and night, part time. Current job postings can be found here, or you can begin the hiring process by texting PHXNOW. Equality Health is an Arizona based integrated, holistic healthcare delivery system focused on improving care delivery for under-served populations with culturally-sensitive programs that improve access, quality and patient trust. Through an integrated technology and services platform, a culturally competent network and a unique cultural care model, Equality Health helps managed care plans and health systems improve care for diverse populations while simultaneously making the transition to risk-based accountability. The company’s mission is to see health disparities disappear and working relentlessly to do its part. Benefits include a variety of health plans and supporting programs as well as paid time off. Offerings include multiple PPO and high deductible medical plans, dental, vision, wellness incentives, employee assistance program, 15 paid days off in year one and paid leave benefits. Current opportunities include senior software developer, senior MySQL developer, credentialing specialist, production development specialist, behavioral health counselor, development operations analyst, physician, pain specialist, quality assurance analyst, call center representative, director, clinical quality improvement, behavioral health, medical assistant, network data coordinator, and business analyst. If interested, please visit Equality Health. Allstate was established in Chicago in 1931 and has been in business for 80 years. Allstate is #81 on the Fortune 100 list and has 70,000 employees in the US and Canada. The SW region is composed of AZ, OK, NV, NM and UT. Allstate is one of the most recognizable brands in America and has 47 products to help serve its customers’ needs. Available positions in Tempe Regional Office include IT, Human Resources, Product, Claims, and Sales Management. Other opportunities are Financial Specialist, Agency Owner, and Licensed Sales Producers. The company is military friendly and offers free education to veterans and a bonus award of $500. In addition, Allstate has a $10,000 referral award. To learn more about careers visit Allstate’s website. In today’s job market, 58% of all new jobs are in STEM. Computing jobs are the #1 source of new wages in the United States. To help you get the necessary skills to compete in this job market, GCU is now pleased to be offering Immersive Java Boot Camp. The camp includes more than 600 hours of project-based collaborative instruction, accelerated path to employment, competitive pricing for an on-site experience, and transferrable college credits. Kristy Bach, Board of Directors, Career Connectors, closed the meeting by thanking Grand Canyon University and the volunteers. 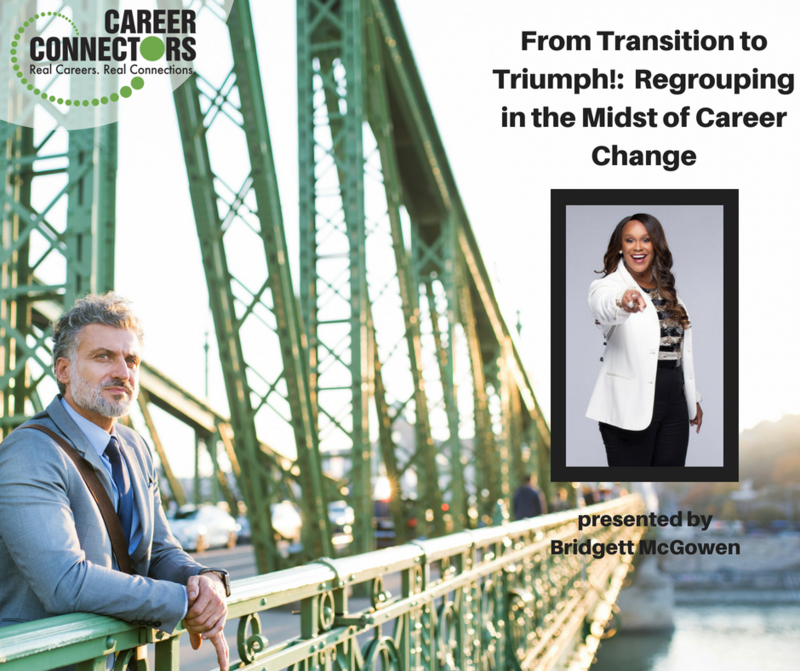 The next Career Connectors meeting will be in Scottsdale on Thursday, August 16, 2018 and features Sean O’Neil, as speaker for the topic “Be Unforgettable.” For additional information on this event and future events, please visit the Event Schedule.